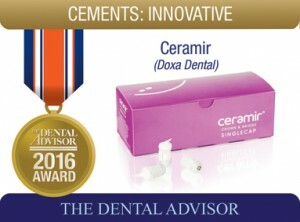 Page view compliments of Doxa Dental Inc.
Ceramir Crown & Bridge is a permanent, radiopaque, bioceramic luting cement supplied in capsules. It is indicated for conventional cementation of metal-, lithium disilicate-, alumina- and zirconia-based restorations. The capsules contain glass ionomer powder and bioceramic (calcium aluminate) powder plus water. Activation of the capsule with the Ceramir Activator is done prior to mixing in a 4000-5000 rpm mixer. Dispensing requires use of either the Ceramir Applicator, Aplicap Applier (3M ESPE) or the AC Applicator (VOCO). Ceramir Crown & Bridge is self-setting with a working time of two minutes and a setting time of four to eight minutes. The cement is designed to be biocompatible and to resist acid and acid-producing bacteria. It requires no etching, priming, bonding, or conditioning. Each box contains 20 capsules of cement and manufacturer’s instructions. 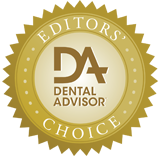 Ceramir Crown & Bridge was evaluated by 20 consultants in 314 uses. This product received a 92% clinical rating. Within the box, each of the 20 capsules of Ceramir Crown & Bridge is individually packaged in a foil pouch. Instructions are clear and concise and are accompanied by a pictorial card for quick reference. Consultants rated packaging and instructions as good. Activation of the capsule is done with an activator available from Doxa Dental. After mixing, the nozzle of the capsule must be rotated 180° before extruding the cement. Failure to rotate the tip can result in cement coming out of the seams in the capsule. Assistants noted that a homogeneous mix of cement was achieved in all cases. Consultants rated the viscosity as very good. The cement is smooth and creamy and coats the surface of the restoration well. Upon seating, little to no resistance was felt by the dentists placing the restorations. Working time was rated as good. Two size of capsules is available, Ceramir C&B singlecap and Ceramir C&B (doublecap), an additional capsules may be necessary for multiple-unit bridges. The two minutes working time is adequate even in cases of mixing more than one capsule. The cement reaches a rubbery stage after additional one to two minutes, when clean-up is recommended. Removal of excess cement at this stage is very easy. After cleanup, the restoration must be stabilized for an additional four minutes. Consultants would like the option of a faster setting time. The cement is a bright white color, which facilitates visibility and clean-up at the margins. In cases of translucent zirconia restorations, shine-through of the opaque cement can occur. There were no reports of post-insertion sensitivity. Fifteen percent of consultants reported that Ceramir Crown & Bridge was better than their current crown and bridge cement and 60% reported that it was equivalent. 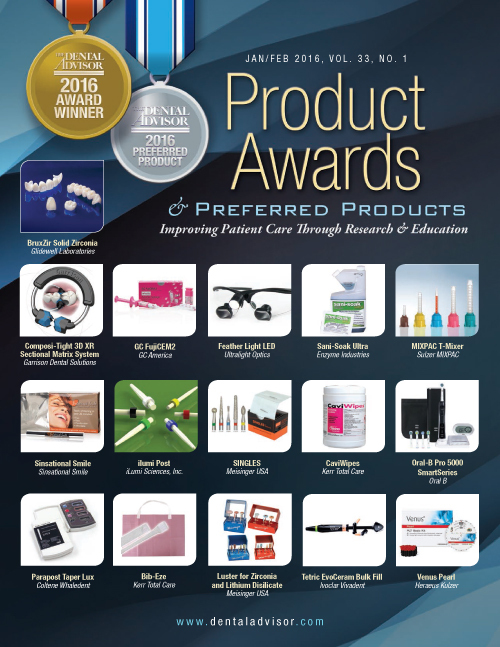 Sixty percent would switch to Ceramir Crown & Bridge and 85% would recommend it. A capsule activator, mixer and applicator are required for use. Perform clean-up in the rubbery phase, around three minutes after mixing. Do not use with lower-strength glass ceramics.